As a homebuilder and home performance contractor, energy efficiency is integral to everything we do. 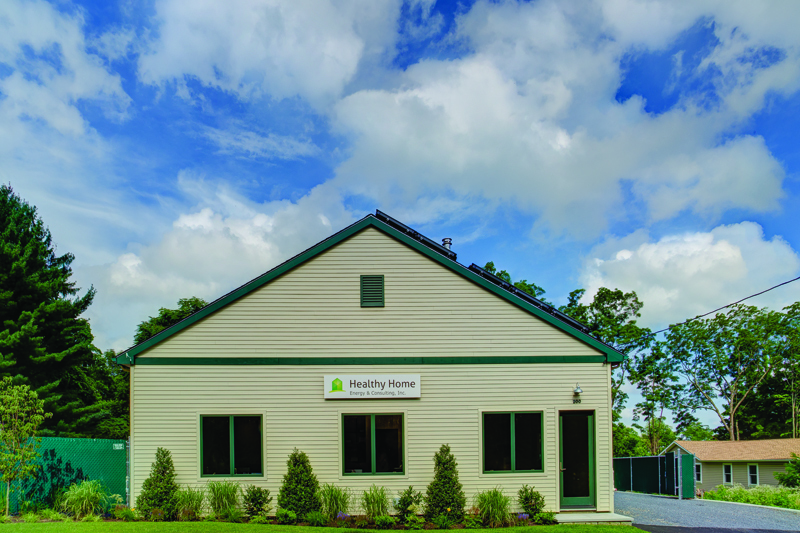 When we needed a new headquarters for Healthy Home Energy & Consulting, we decided to build a net-zero facility that would use no fossil fuels and produce as much or more energy on site than we would use on an annual basis. After searching for a location that would offer relatively flat property and a due-south orientation, we selected a 90-year old pole-barn-style highway department garage—a commercial building in a residential neighborhood that could be easily retrofitted. The large south facing roof area was strategic to the efficiency of our 10 solarthermal and 56 solar-photovoltaic roof panels. We developed a design for a light-duty commercial space that would meet our needs. We used OptiMiser modeling software to conduct energy calculations before choosing our mechanical systems. Within the salvaged footings and framing, we installed Zip System Rsheathing to reduce the number of products needed between the studs and siding. Recycled lumber from work sites was used for interior trim. We used Hardie-Plank exterior siding made of sustainable materials. Inside, we started with a very tight envelope with as much R-value as we could fit into the cavities. We used low-VOC spray foam to insulate our thermal envelope including the underside of the roof. Our building is extremely air tight with an ACH50 number of 1.16. To compensate for that tightness we installed a Zehnder 550 ERV. This system controls the air flow in the building to ensure that the appropriate amount of fresh air for comfort and indoor air quality is present at all times. On winter workdays, we heat our office by fueling our 93-percent efficient,Twinfire wood-burning stove with salvaged logs from our work sites. This heat is supplemented by radiant heat in the slab for the office and storage areas generated by our solar thermal panels. Our irrigation needs are fulfilled by a rainwater harvesting system that collects water from the roof of the building. In order to maximize energy efficiency, we chose Energy Star-rated windows, doors, appliances and electronics. In some ways, the building is more similar to a home than a commercial building because we have all the amenities of a typical home. Building the most energy-efficient home or workplace isn’t a productive exercise if there are no goals or systems in place for measuring performance. Therefore, sensors throughout the building report continuous data such as real time energy production and usage, indoor and outdoor temperature and humidity, VOC and CO levels, Solar Thermal BTU production and usage, ERV status and flow, and rainwater tank levels. Our monitoring system is cloud based so that we can “check-in” from anywhere and at any time. Our new headquarters benefits both our employees and our community, as we removed an eyesore from a residential neighborhood and created an attractive, responsibly-constructed commercial building in its place. This is a replicable net-zero energy model for both light-duty commercial and residential use. I spent a year searching for the right location that would offer relatively flat property and a due-south orientation to support the net-zero goals. Proximity to the Brenner Builders office in Bedford Hills was paramount. After eliminating dozens of options due to excessive shade, incorrect exposure, or roof pitch (which would have hampered the efficiency of the solar systems), I received a call from my broker about a new listing in the town of Somers – only a 16 minute drive from Bedford Hills. The structure at 200 Tomahawk Street was built in the 1920s as a polebarn- style garage for the Somers Highway Department. It was a commercial building in a residential neighborhood, so its non-conforming-lot status came with limitations. While the footprint could not be changed, it had all the other elements required for a successful net-zero endeavor, with the added advantage of being on a well-traveled street. From a marketing point of view, the site was perfect for exposure and recognition. Domestic hot water - Manufacturer & Model American Water Heater Co.